You already have a piece of paper in front of you? Your pencils are already sharpened? Your coffee’s already brewed? Then you’re all set! … Right? If you’re not exactly sure where to start, don’t worry just yet. I’m going to share my secret recipe with you, which will help you create a great survey in only 5 steps. Let’s get cooking! Customer feedback is extremely helpful for the decision making process. The best kind of improvements are going to be those based on customer requests, as they’re the ones you’re improving for! If that’s exactly why you’re here, but you still aren’t sure where to start, then ask yourself this: “What do I want to know more about?” That blank piece of paper is probably acting as an inspiration right now – lighting up your imagination, helping you come up with answers to that question. Well then – get writing! Having a clearly-defined focus will give your creative process much-needed structure and simultaneously help you along when you’re feeling writer’s block. After you get all of those ideas down on paper, take the time to pat yourself on the back, because you just took your first step to the creation of your survey! What are my customers accustomed to? How much do my customers like my website? What other kinds of online stores do my customers use? Do I need to improve the quality of my product descriptions? 1. How much do my customers like my website? 2. Do I need to improve the quality of my product descriptions? 3. What are my customers accustomed to? 4. What other kinds of online stores do my customers use? Pursue only one main question per survey! You can divide it into 2-4 individual subsections, but all of these must relate to your main question. Once you’ve prioritized your list, your main question should be easy to spot. You can create different surveys for all of the other questions on your list later. Should you already have a main question, go ahead and skip this step. Is the website neatly arranged? Is the online shop easy to navigate? Is there any sort of information missing on the website? All of the stated sub-topics correspond with the main focus of the survey, enabling you to gather specific information on what you really want to know. Now you can start defining the questions for all of your sub-topics. Were you ever not able to find the product you were looking for? How satisfied are you with how the products are displayed? 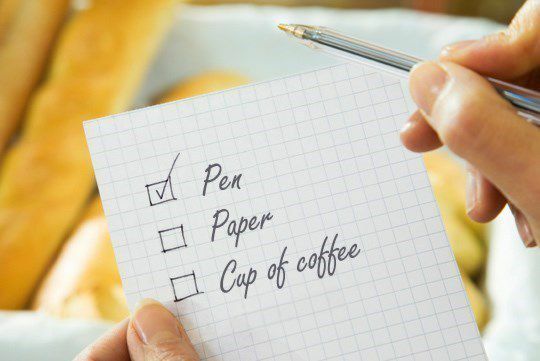 If you followed all 5 steps correctly, then your coffee shouldn’t be the only delicious thing on your table – your savory survey should be right there with it! Enjoy your meal! In case you don’t have all of the required ingredients at home, you’ll find a ton of pre-seasoned survey templates. Here’s the secret recipe for your next delicious questionnaire.